The right magnification for me? “I am a recently graduated neurosurgeon practicing in Canada. I used DFV 2.5x Loupes with a microLED Headlight for 6 years in residency. I was satisfied with the loupes overall. Having 2.5 x Loupes gives you a wider range of working distance which is valuable when you are often the assistant rather than the primary surgeon. But the headlight ate through batteries, the light became dim after a few years, and the replacement costs were very high. “When I bought my pair of Exam Vision/Synca loupes I was reluctant at first due to my past experience with loupes. I owned a pair of Orascoptic loupes for over 10 years and I rarely wore them. They made me dizzy and were heavy and uncomfortable. For 10 years I was convinced that I was just not a good candidate for loupes and that I would never get used to them. I compromised the quality of the dentistry I was providing due to the fact that I was seeing everything with the naked eye. When I received my pair of ExamVison/Synca loupes, I couldn't believe the difference. It literally took me five minutes to get 'used' to them. The range of view is quite long and I no longer felt dizzy while wearing my loupes. They were lightweight and I was able to secure them over my ears by bending the frames. No more need to tighten the strap behind your head! The quality of the frames and optics surpassed my expectations. Now that I am wearing my loupes consistently, I have noticed a difference in my posture. There is much less strain on my back now that I am working in an upright position. I no longer have to get up close to see what I need to see. Hugo Matasol, my Synca sales representative, did an excellent job in recommending the right size frame and magnification to fit my needs. The appointment was quick, yet informative, and all of my questions and concerns were addressed. I only have one regret, and that is waiting so long to have found this company!!!! I would highly recommend them to anyone! If you are looking for a new pair of loupes, you should definitely give Synca a call. “The other day, I was extracting an upper left 2nd molar. The Mesial Root was fractured and I had to find and remove the small apical root fragment. With my normal vision and my prescription glasses, I could not see the root fragment. With the beautiful loops from SYNCA, I could see the small piece with room to spare. The root was removed thanks in large part to the loops. I honestly don't believe that I could have finished the procedure without the SYNCA Loops. Many dentists who are of my vintage will not admit that their eyesight is not as good as it once was, when they were much younger. They tend to fool themselves and continue to practice with poor eyesight instead of facing the facts and true picture that, as we get older our eyesight diminishes and fails. Instead of ignoring this physiological fact, they should seek professional advice such as SYNCA representatives, and solve this age-old problem. Dentistry is a demanding profession, and dentists in good health are practicing much longer today than ever before. However, when eyesight comes into the picture, we need special care and advice. That's where SYNCA comes into view. I have also examined other Loops and glasses. I'm not impressed. You get what you pay for. 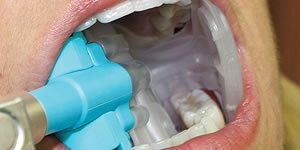 SYNCA products are ʹOn the top of the classʹ. “I wanted to thank Synca for selling me such a quality product! I'm very pleased with how clear things look through my new Loupes with the prescription. I had been hesitant as the clarity of the demo loupes was not what I had expected, however, with the satisfaction guarantee, I went ahead with the order. Very pleased that I did. My welding has improved. I did some test welds tonight and noticed right away that I could see more definition in the molten puddle in the TIG welding process. I also was aware of my improved posture, my head is further back and I find I was instinctively straightening my spine to accommodate my head position. As well, I have attached the light to the exterior of my welding helmet, a noticeable difference with the light on. “My husband and I have been using ExamVison Loupes since 2012. As Ophthalmologists we can say that these loupes are excellent. The sharpness and brightness of the images are spectacular. They are very light weight and the lenses are manufactured using high quality optics from Europe. “I have been extremely satisfied with the quality and reliability of my Exam Vision loupes. After purchasing loupes from two other companies (Orascoptic and Heine) and not being fully satisfied with either, I decided to spend a little bit extra and purchase Exam Vision 3.5x loupes, which was an excellent decision. It is no secret that Exam Vision loupes are slightly more expensive than most other companies, but you certainly get what you pay for, which in this case is a premium product. As with buying a vehicle, computer, or piece of clothing, you typically get a higher quality product when you spend a little bit more, and when it comes to something I wear for a large percentage of my day, every day, I prefer the best. The loupes are comfortable, durable, look good, and most importantly, the quality of the lens/magnification is top notch. I am able to get the same field of view out of my 3.5x Galilean loupe as most other 2.8x loupes provide. Overall I can say that I have been fully satisfied with my Exam Vision loupes and would recommend them to any of my colleagues. “I own two pairs of loupes from ExamVision; the first pair is a Galilean 2.8x (with Prisma Lens System), and the second pair is a Kepler Kompakt 4.6x. I also have the Focus 4500 light, which in my opinion, is a hidden gem amongst ExamVisions LED lineup. The Keplers are on their way yet, but I have much to say both about the products I currently own as well as the customer service experience I have had. First of all, the Galilean 2.8 with Prisma Lens System (PLS) are by far the best loupes I've ever tried or owned. They make every procedure more comfortable, and my head tilt is beyond optimized because of the combination of PLS and the steep declination angle. The field of view and depth of field are so large that I see the entire oral cavity in focus, plus the surrounding peri-oral tissues. I use them for everything, including surgery and exams. The clarity is impeccable, and the frames are great, too (large sport frame). 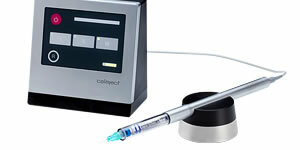 The focus 4500 light is an absolute delight to work with as well, as it has a very natural colour of light while maintaining a reasonable level of brightness for most procedures. The only thing that may require a brighter light source would be socket inspection or endodontics, in my opinion. And it's true what they say - this light does NOT cure composites! (I work with Filtek Supreme Ultra). I've never had any issue with accidental curing, and I spend a LOT of time shaping my composites. I'm looking forward to the arrival of my Kepler Kompakt loupes for more demanding restorative procedures and endodontics. “The acquisition of my new loupes brought a lot of benefits to my daily clinical work. 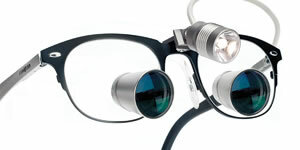 Previously I had loupes from OPTIKMEDIC - ExamVision is a change for the better. Having experiences loupes from 2 different companies for a prolonged period, I can understand and appreciate the major differences. A main difference is the position of my neck and head. My working position is improved and much more ergonomic. This is an immense advantage, considering the frequency and degree of musculoskeletal problems within our profession. I also noticed an enormous improvement in the clarity and brightness of the image. The loupes are also lighter and have less tendency to slip during procedures. 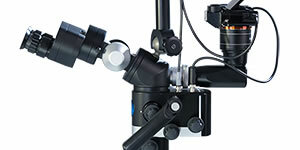 “This review toward KEPLER KOMPAKT TTL 4.6X Loupes on Icon Plano frame with Focus 6000 LED Lighting System. Overall, the unit is well made with clear and clean finishing edges. The frame is well balanced. The nose pads and arms are adjustable intuitively. It has a good feel on my face. Kepler loupes are captivating with clear, live image of the tooth. I can adjust the focus point as the tooth position change. The light complements my view field with natural white color that does not strain my eyes. 4.6 X magnification keep me on the chair. “Dear Synca, thank you for the fantastic service and loupes!! From start to finish, you have been very efficient, clear with pricing and your aftercare has been brilliant. The loupes have helped my back significantly at work, and I cannot work without them!!! They loupes are very light and the field of vision is very clear. As the frames are made from titanium, it is very robust. The light provided helps a lot when doing very intricate work and I am so glad I invested in a pair of ExamVision loupes. Prior to ordering the loupes, I enquired about them as I was from the UK. Hugo the Rep for Western Canada explained everything clearly giving me all the options allowing me to make a decision based solely on my need. I met Hugo in BC and he again explained the benefits of the loupes and gave me all the options. Once I received my loupes, it needed a small adjustment and Synca organized everything from collecting the loupes to the adjustment and quick delivery them.